Ecommerce has seen something of an explosion in recent years, with online shopping becoming increasingly popular. Set to continue, e-commerce businesses are expected to represent 17% of all retail purchases by 2022. However, with the market becoming increasingly saturated, it is essential that e-commerce companies can stand out from their competitors. One of the best places to start when looking to improve your strategy is your customers. After all, as the focal point and key to success of any e-commerce business, providing the best experience is essential – both to attract and retain customers. As such, before implementing changes, seek feedback from customers. This will give you a better idea of their current experiences and provide real insight into worthwhile improvements. You may already have a social media page where you post new products and your company’s latest deals, but this is not enough to gain the edge and set your ecommerce business apart. To fully utilise the benefits of social media, businesses must use it as a means of communicating. Connecting with customers is pivotal. Talk to your customers, join in conversations, start discussions, pin products and show that your company has a personality. More of us now shop online using mobiles and devices than desktops, meaning it is more important that ever that your e-commerce site is mobile-ready. There are two reasons for this: to provide a better experience for customers, and to ensure that your website ranks well in search engines to drive traffic – read here to find out how you can optimise your e-commerce site and make it mobile friendly. It is quite common for a customer to add items to a cart and not follow through with checkout. You may think this is a lost sale, but this is not necessarily the case. Improve your strategy to increase your sales by chasing abandoned carts. Send an email reminder to customers that they have items in their cart, provide a link for quick checkout, and consider sending an incentive or discount to increase likelihood of purchase. In the world of e-commerce, it is not enough to create the perfect website and social media pages. To be successful, your business must continually evolve. Keep an eye on trends, latest e-commerce statistics and developments. Up your game by making tweaks and editing your approach. This could include updating your website, looking at SEO trends and developments. As stated by a blog post on Parcel2Go, the most important thing you can do is make sure you have cheap and reliable shipping. When you are looking for distribution either domestic of international, make sure you choose the industries’ best. They should offer a wide range of domestic and international delivery destinations and should offer next day delivery for certain areas. It should also allow users to track their order as soon as you have sent it for their peace of mind. 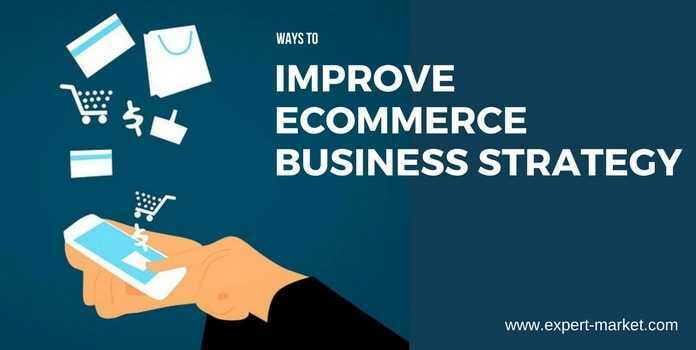 Using these tactics and suggestions could improve your ecommerce business strategy. In turn, these amendments could help your company to stand out, increase sales and customer numbers, and lead to more success.